SHELBOURNE HAVE APOLOGISED to their own fans and St Patrick’s Athletic supporters after last night’s FAI Cup game was postponed. 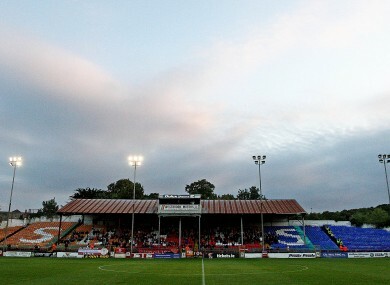 The third round replay at Tolka Park was called off prior to kick-off after a blown transformer in the generator resulted in failure in some of the floodlights. The match has been rescheduled for next Monday, 1 September, with an 8pm kick-off and the SSE Airtricity League First Division club have said sorry and thanked fans for their patience. “Shelbourne FC would like to apologise to all our fans and those of St. Patrick’s Athletic who attended Tolka Park last night, only to have their evening spoiled by a floodlight failure,” the statement reads. “All tickets will be valid for the rearranged game next Monday evening (ko 8pm) but should you wish to have a refund please note that our ticket hatch will be open from 10am to 1pm and from 2pm to 4pm today, when refunds will be given on production of ticket. Email “Shelbourne apologise to fans after floodlight failure at Tolka Park”. Feedback on “Shelbourne apologise to fans after floodlight failure at Tolka Park”.